I’ll admit it: I’d never cooked a butternut squash before. Prior to the CSA, the closest I’d come to having a butternut squash in my kitchen was when we used to buy them to shred in a Salad Shooter for dh’s iguana. (No, really, you can’t make stuff like this up.) So, I didn’t have a ton of ideas of what to do – but I knew that the crock pot really needed to figure in it somehow. What follows below is one of those rare things where I’ll recommend that you not let it go much longer than the recommended cook time (6-7 hrs). The squash came out wonderfully, to the point where it just melted on the tongue, but I have the feeling that letting it go for our standard weekday cook time (~11 hrs) would have turned the squash to mush. As it is, this is DEFINITELY getting made again. I’m not a huge fan of the time it takes to peel the squash (OMG are we there yet?! ), but the result is a light, sweet dish that combines two great fall tastes. 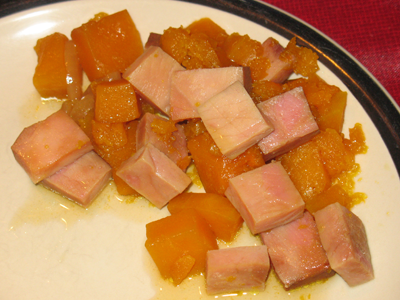 Note that you can make this with ham steaks or a quarter ham – just make sure that you cube the ham and the squash to about the same size chunks. We needed a light meal after a day at the Topsfield Fair, so we ate it all on its own; on a typical night, this would probably go nicely with either some brown rice or a nice loaf of crusty bread. 1. Peel and thinly slice the onion and garlic. Peel, seed and cube the butternut squash. Cube the ham to roughly the same size as the cubes of butternut squash. 2. Coat the bottom of a 5qt crock pot with the olive oil. Layer the onion slices and the garlic in the crock pot. 3. Mix the water and soy sauce and pour over the onions and garlic. 4. Add the squash to the crock pot. Layer the ham on top of the squash. 5. In a bowl (or measuring cup), combine the maple syrup, apple juice and powdered ginger. Pour over the ham and squash. 6. Sprinkle the brown sugar on top of the ham; distribute as evenly as possible. Cover and cook on LOW for 6-7 hrs. This entry was posted in crock pot cooking, entrees and tagged cooking, crock pot, crockpot, eat local, locavore, meals by crunchymetromom. Bookmark the permalink.